Genie Timeline Home is a Time Machine for Windows. The software performs real-time and continuous data protection. System Files, emails, documents, music, pictures and anything else on your machine. The software backs up your data in the background. With a click of a button, you can retrieve deleted & backed up files. 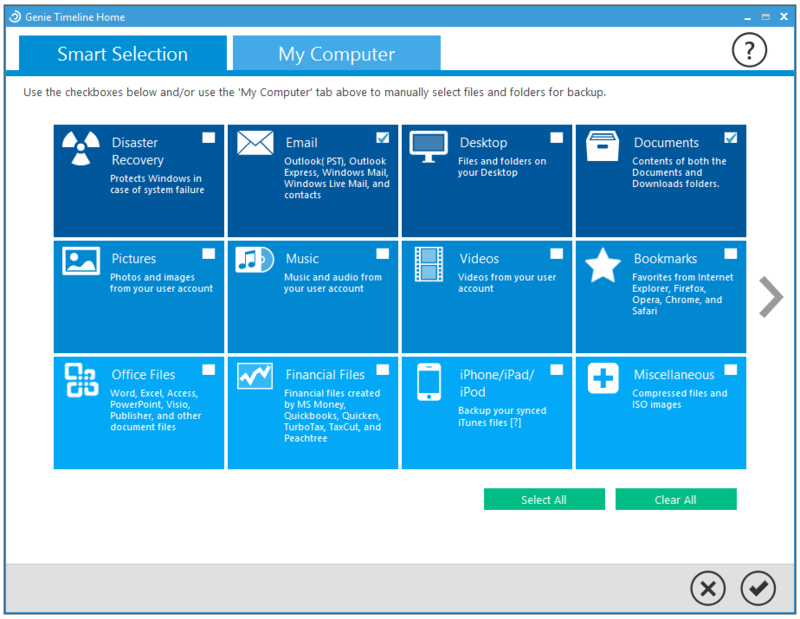 Genie Timeline Home 10 offers effortless protection to your PC by backing up all files. Set it once and you will not have to worry about losing a file again. Genie Timeline Home is a real-time backup solution for all your files and folders. This is an easy-to-use backup tool, that will watch your computer and keep copies of all the files you want. The application designed to be a Windows Time Machine. It performs seamless automatic real-time backup for all your files and folders. Genie Timeline Home 10 is the first complete backup software. It aims to protect all your computer’s data. The software makes it easy to backup your important personal files – it only has three steps. With a 3-step setup wizard, the app is ready to work on your machine without the need of any user intervention. Select a drive to save your back-up, then choose what you want to back up. Next, set your backup options and enjoy enhanced features such as disaster recovery and backing up a variety of data types. Synced iTunes content and compressed and archived files. The My Computer tab, lets you select files and Folders to back up. No need to worry about disasters to your system, the software can restore all your settings and data. Include Disaster Recovery in your backup selections. Create a Disaster Recovery Startup Disk on a virtual partition, a USB disk, or an ISO image. So that you could restore your data in case of failure. The software uses Incremental Block Level technology to back up only modifications or changes made to the file. Instead of backing up the entire file, saving you both time and space. The lightweight software monitors your system’s performance. Recognizes when you are playing a game or watching a movie or running a presentation and alters its performance mode. It will also run on low resources when your computer is running on batteries and will pause when the power level becomes critical. Genie Timeline Home is fully integrated with the Windows operating system. Also, you can add/exclude files or folders to the backup with a simple right click. With Timeline’s Backup Markers you can see which files have been backed up and which files have yet to be backed up. Track what data types are being backed up with the Backup Breakdown. Which displays the capacity and distribution of data types in informative charts. Genie Timeline also uses a timeline view to show saved versions. To restore files, click Advanced Restore on the main menu, then use the slider to choose the backup date. Files can also be copied directly from the ‘Genie Timeline’ folder on the backup drive. Simple and Easy: Setup is done in 3 simple steps. Disaster Recovery: Restore your system and data even if your operating system no longer loads. Intelli Continuous Data Protection (CDP): Data is continuously backed up depending on file types. Restore: recover old files, whether through Timeline explorer or the search feature. Performance: Genie Timeline runs in different modes depending on PC usage. Data Types: Backup a wide variety of data such as E-mails, Documents, Desktop, Office files, eBooks, Bookmarks, Pictures, Videos & Music. Backup Breakdown: Get a clear picture and understand the details of what is being backed up. Merges with Windows: fully integrated with Windows, you can add/exclude files or folders from the backup very easily. Compatible with Windows 10/8.1, Windows 7, Vista and XP. SOS is offering the Home edition of Genie Timeline for free. To get this effortless backup solution license ($39.95 worth) for Free, visit this promotion page, hit Download and fill the form to receive license code. Note: Use temporary email service such as 10 Minute mail to avoid spam, also don’t download SOS installer. Download the installer from the developer page, register with the serial number you received.